The versatile MTM Front Rifle Rest and Handgun Pistol Rest offers excellent rock solid stability at a price any shooter can afford. 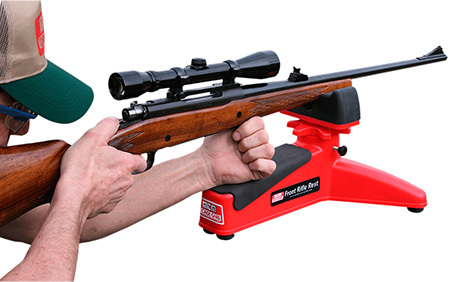 This threelegged rest not only accommodates nearly any shape gun stock but handgun enthusiasts will find it just as accurate. The nonmarring special rubber shooting pad supports nearly any shape stock or barrel with a wide wobblefree stance and gripping rubber feet. Its rear leg has been extended widened and raised with a black pad for comfortable handgun support. It has precision dialed adjustments offering 3 of vertical travel for pinpoint accuracy."